Dolly Parton first opened the Dixie Stampede Dinner Attraction in Pigeon Forge, TN in 1988. In the nearly 30 years since then, this dinner show has become a staple of families visiting the Pigeon Forge/Gatlinburg area, and it's no wonder why! With two shows and dinner in one ticket and entertainment ranging from daring stunts to side-splitting comedy that's suited for the whole family, this show is bound to be the highlight of your family vacation! This show was recently renamed as "Dolly Parton's Stampede Dinner Attraction." Though this show has a new name, it still offers the same classic entertainment that keeps audiences coming back year after year! About 50 minutes before Dixie Stampede Dinner Attraction starts its dinner show, guests are welcome to wander the open-air stables, meeting the true stars of the Dixie Stampede Pigeon Forge cast – the horses! Horse-lovers of all ages are sure to enjoy the majestic, muscular build of the American Quarter Horse, the golden coats and white manes of the Palomino horses, and the speckled coats of Appaloosas. After getting to meet the stars of the show, follow one of Dixie Stampede's charming Belles, beautifully dressed in period dresses, and enter the 2-level Saloon for the opening act, Mountain Ruckus! This bluegrass trio will have you stompin' your feet and slappin' your knees with their lively renditions of bluegrass classics, country favorites, and maybe even a few surprise numbers from the pop charts! Enjoy refreshments, such as popcorn and sodas, while Mountain Ruckus amuses with their comedy, country, and bluegrass all in one wonderful opening act! After this entertainment appetizer, it's time to move on to main show in the massive 35,000 square foot arena! To add to fun, seating is divided into North and South sections (Rumor has it the best seating is in the South section). Throughout the show, competitions are held between the North and the South and points are tallied at the end to see who wins! Dixie Stampede Dinner Attractions offers guests a filling 4-course meal that is delivered throughout the show and includes scrumptious fried chicken, delicious pork,a flavorful baked potato, buttery corn on the cob, a flaky biscuit, creamy vegetable soup, and a delectable apple turnover. Let the Dixie Stampede Pigeon Forge cast amaze you with their superb horse tricks! The feats of the talented equestrians will keep the audience on the edge of their seats! 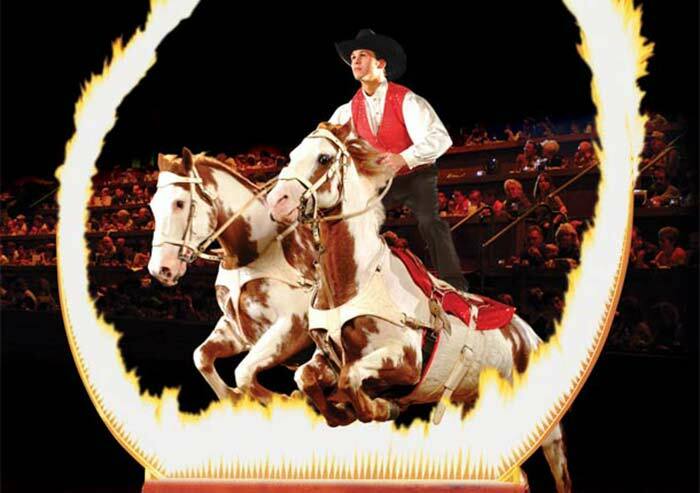 With numbers showcasing East Tennessee's rich history - from the native Cherokee population to the adventures of rugged early settlers to the Civil War - Dixie Stampede Dinner Attraction takes you through time with stunning equestrian numbers and tricks. However, it's not all about the horses! Enjoy the memorable piglet race and perhaps get to participate in the great chicken race! At the end of the show, a stirring patriotic number with Dolly Parton's "Color Me America" will move the entire crowd! During the holiday season, enjoy a special Christmas show complete with St. Nick, elves, and evergreens! Dixie Stampede Dinner Attraction transforms itself into a winter wonderland with holiday-themed numbers and a heart-warming nativity scene. Dixie Stampede Dinner Attraction in Pigeon Forge, TN will stand out as one of the highlights of your trip to Gatlinburg or Pigeon Forge! With great Southern food, spectacular live entertainment, and a family atmosphere, you and your family are sure to return to the time-honored favorite of Pigeon Forge dinner shows year after year! Showtimes and pricing for Dixie Stampede Dinner Attraction are available at www.dixiestampede.com or by calling (865) 453-4400. Visit our Pigeon Forge Dinner Shows page for details on additional dinner shows in the area. Looking for accommodations to enjoy this and other great Pigeon Forge dinner shows? Explore our list of premium Pigeon Forge cabin rentals in the Smoky Mountains for convenient lodging near excellent Pigeon Forge attractions.